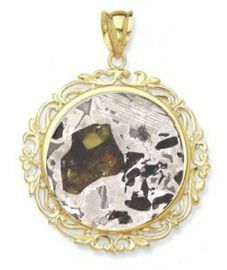 This is truly the "top of the line" of meteorite jewelry and it is sometimes referred to as "celestial stained glass!" Pallasites are the most beautiful form of meteorite jewelry! They are a mixture of crystalline yellow to green olivine (peridot gem) naturally embedded in a network of nickel-iron. They are among the most sought after meteorite specimen to complete any serious meteorite collection. The name "pallasite" comes from the name of the German naturalist Peter Simon Pallas, who first took interest in pallasites and described it in his writings, in 1772. This meteorite is called Seymchan. It was found in 1967 in Magadanskaya, Oblast, Russia, near the settlement of Seymchan. This is a fantastic Seymchan pallasite meteorite set in 14K gold in an open brocade design. Beautiful style, color and it contains at least one great green "window" to see through side to side when held up to the light. "A fantastic meteorite and a beautiful gift from our cosmos!"